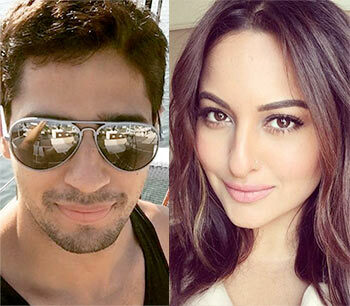 Rediff.com » Movies » Can Sidharth-Sonakshi pull off Ittefaq remake? VOTE! Can Sidharth-Sonakshi pull off Ittefaq remake? VOTE! Sidharth Malhotra and Sonakshi Sinha will team up in a remake of B R Chopra’s iconic film Ittefaq. Starring Rajesh Khanna and Nanda, this thriller is a must watch, and here are the reasons for that. While Sidharth and Sonakshi are a new pair, and look exciting together, are they fit for this project? A veteran filmmaker doesn't seem keen. "Siddharth and Sonakshi are popular stars but can they fit into roles immortalized by Rajesh Khanna and Nanda? Sonakshi can perhaps pull off Nanda’s role as a clever, calculating, manipulative murderess. But Sidharth in Rajesh Khanna’s role is a stretch," he says. He feels Siddharth is too inexperienced to play the complex psychologically layered part. "Rajesh Khanna was a seasoned theatre actor. He could pull off the tense anguished role," he feels. The new film will be directed by Abhay Chopra. Can Sidharth and Sonakshi pull off an Ittefaq? VOTE! Teacher's Day Special: What Bollywood has taught us! Aamir, Akshay or Kareena? Vote for the Coolest (and Cutest) Bollywood Teacher!